Please bear with me with this blog page. We’re still working on final formatting, so things are a little quirky. I’m hoping to have everything back to normal in a couple of days. I really appreciate your patience. Today, I’m just going to be sharing images of these hors d’oeuvres and the recipe. Short and sweet! 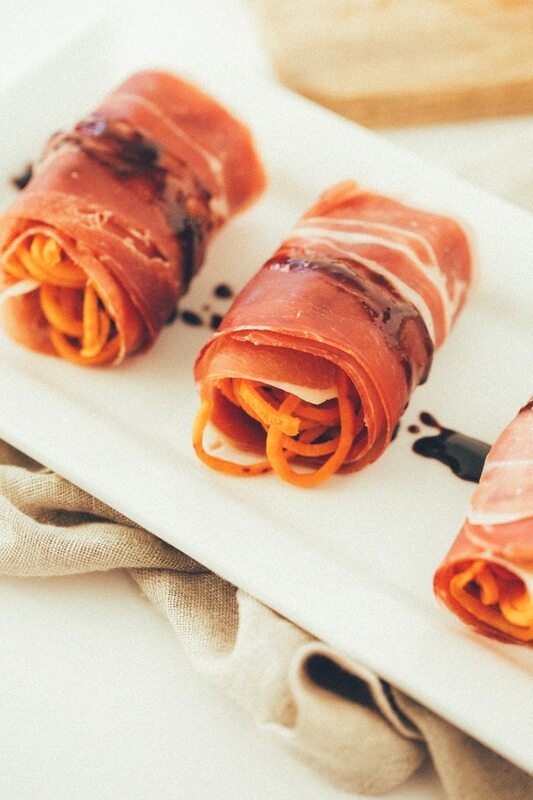 These luscious sweet potato noodle rolls are perfect for serving with wine or cocktails. 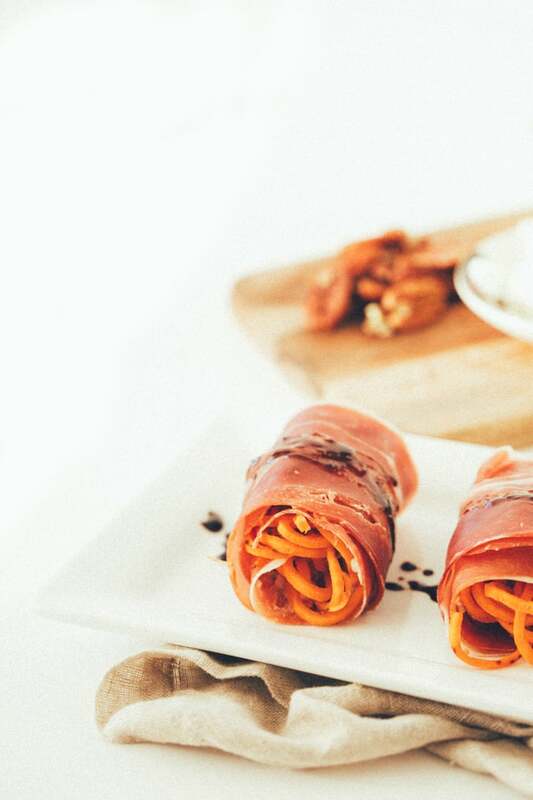 The fluffy sweet potato noodles, the soft goat cheese, the sweet dates and the crunchy pecans are wrapped up in savory prosciutto. Then, there’s the maple-balsamic drizzle that makes this plate of party bites epic. There’s so much flavor, color and texture here, that your guests will be impressed. After rolling up the prosciutto, I slice these in half to make smaller, bite-sized pieces. However, if you’d like to leave them whole, you can – they make more of a starter course that way, less like hors d’oeuvres. Either way, you’re going to love making these – they’re easy, they come together quickly and they can be prepared ahead and saved until your guests arrive. What’s your favorite way to incorporate spiralized veggies and fruits into your party appetizers? Place a large skillet over medium heat and add in the olive oil. Once oil heats, add in the sweet potato noodles and season with salt and pepper. Cover and cook for 5-7 minutes, uncovering to toss occasionally, until noodles soften and cook through. While the sweet potato noodles cook, whisk together the syrup and vinegar in a small saucepan and then bring to a boil. Cook until reduced to 1/3 cup, about 3-5 minutes, stirring occasionally. Remove from heat and stir in the mustard. Set aside. Lay out two pieces of prosciutto and smear with 1/2 tablespoon of goat cheese. Then, sprinkle with about 1 tablespoons of pecans and then sliced dates from about 1 date. Lay out a layer of sweet potato noodles. 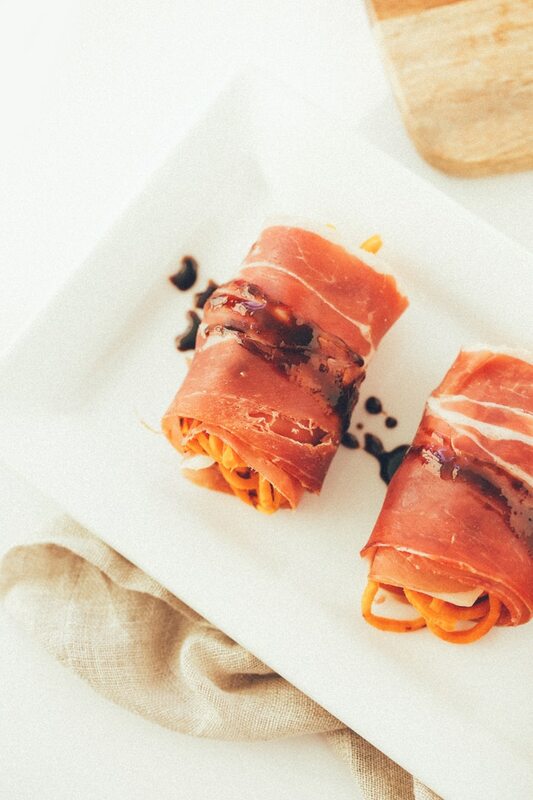 Roll the prosciutto to wrap everything up. Slice in half and secure with a toothpick. Repeat with remaining prosciutto, to create 6 in total. If you’d like to create larger appetizers, don’t slice in half and only create 3. Arrange rolls on a serving platter and drizzle each with some of the maple-balsamic. Serve immediately. You can discuss about traditional usages of shrubs with old age growers, and can make them best part of your life. Rub a good sized raw and skinned potato on your old, dirty shoes. Most diets are high in omega-6 fatty acids, and thus flax seed oil is great because it contains a higher amount of omega-3 fatty acids than of the 6's.